I love the shirt I found (behindthebit.spreadshirt.com) and blogged about yesterday. That said, it's hard to find really good, clever dressage t-shirts, and the shirt to my right proves it. It's from Zazzle.com, a company that posts shirts that anyone with an account can design. 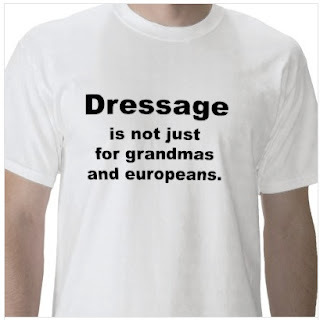 Dressage t-shirts messages seem to always be have one or several of these elements. Verbiage about being perfectionist, perfect, achieving perfection -- sorry, they just seem a little smug. The horses are doing upper level movements, and maybe the verbiage suggests the wearer does upper level movements. I've never done so much as a half-pass. Don't think I'd be fooling anyone! General snootiness, like here, or here. Awkwardness -- like what we see on the right. Hardly pithy, is it? Some are a little too naughty. Okay, the naughty underpants mad me laugh. It's going to take me awhile to come up with an entry. "Learn dressage from A to Z and you're going to get lost in the arena." "Dressage, the sport for those who haven't learned the alphabet." I kind of like the the 17 hands one... hahah! I have an awesome shirt that says "I halt for dressage" with a thellwell style illustration. I sure can't wear those undies- my horses aren't even 15 hands!! I like the one from Jean- "Dressage, the sport for those who haven't learned the alphabet." Ha! I have the 17 hands one on a t-shirt! No witty dressage sayings though.. sorry. This one really isn't mine. I've seen it on a bumper sticker, but I'd like it on a t-shirt. also had a long sleeved shirt once that had Ride The Corners down the sleeves. Raising my hand for the "Whinnying is everything" shirt. I'd buy it! And wear it every time I haul Quinn to an event. He is beyond annoying with his need to talk to everyone, as loudly as possible. You really should start your own line. I think you're onto something here! Someone in comments on another blog mentioned instead of Carpe Diem a farm should be named "Carpe Manure Fork". I love that. Dressage: The Priciest Route From Point A to Point B.
LOL! I love yours. Those are fantastic. I'll have to think on it. I'm too tired to be clever right now. How long do we have to think of something? "Dressage Riders do it with their seat!" Well I don't have any clever sayings to share but did want to say that the ones left are great. I bought 3 of the dressage love shirts yesterday, one for me and 2 for friends (even though one is a crazy eventer). I don't have any clever sayings to share, but I did like the one that Jean posted, "Dressage, the sport for those who haven't learned the alphabet." Some days I don't know my left from my right. I did however buy 3 of the dressage love tshirts, one for me and the other 2 for friends (even though one is a crazy eventer). "Dressage" aka legal human torture sitting trot style. Nothing yet thrills me. Okay, let's open it up to not-just-dressage, but horses in general (whinnying is everything for ex). Keep the ideas flowing, and if you like a particular comment, comment in support of it! Think pithy and repeatable. Thanks! Horse Back Riding - the sport you can spend your whole life learning. I don't know, creativity is GONE. 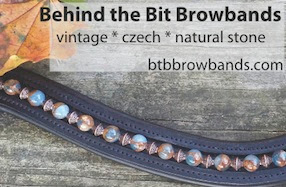 Dressage riders do it with Schwung? This is dressage on a budget (plain heather grey t-shirt, courier font). Equestrianism: The only sport where you can talk about whips, spurs, and leather without being called a pervert. I ride, therefore I rule. According to my horse, 'Go' is the new 'Whoa'. I make carrot slobber look good. If a half-halt is a partial halt, what does that make a half-pass? Isn't a spur stop an oxymoron? I *loved* the following one, "Equestrianism: The only sport where you can talk about whips, spurs, and leather without being called a pervert." I could also picture a t-shirt with the quote "I do all my own stunts" I can envision this working with several different pictures, eventing, rodeo, or even just a cute horse. My dance partner has two left feet. I loved it - I want a bumper sticker with that. My Arabian put the Warm in your Warmblood. Without Arabians, that Warmblood you're on would be a Budweiser Clydesdale. Dressage, where the weak are killed and eaten. I am so not good at this! "Yes, I have whips, boots, and spurs. Why?" "I get my thrills with Western Pleasure."